Given by Empress Alexandra Feodorovna to Marion Louisa 'Pollie' Delmé-Radcliffe, Baroness Ungern-Sternberg, June 1898. I must send you a few lines to tell you how much my thoughts and prayers will surround you next month. God bless & protect you, Darling, & may you not suffer too much-tho one willingly suffers, so as to have the intense joy of holding one's own precious Baby in one's arms. I have worked a quilt for you to cover the tiny little Being with-the brooch is for you as a wee remembrance of a dear friend. On 7 July 1898, Pollie gave birth to a daughter, Alix Louisa Emilia Marion Hedwig von Ungern-Sternberg. The baby girl was named Alix after the Empress, who became her godmother. 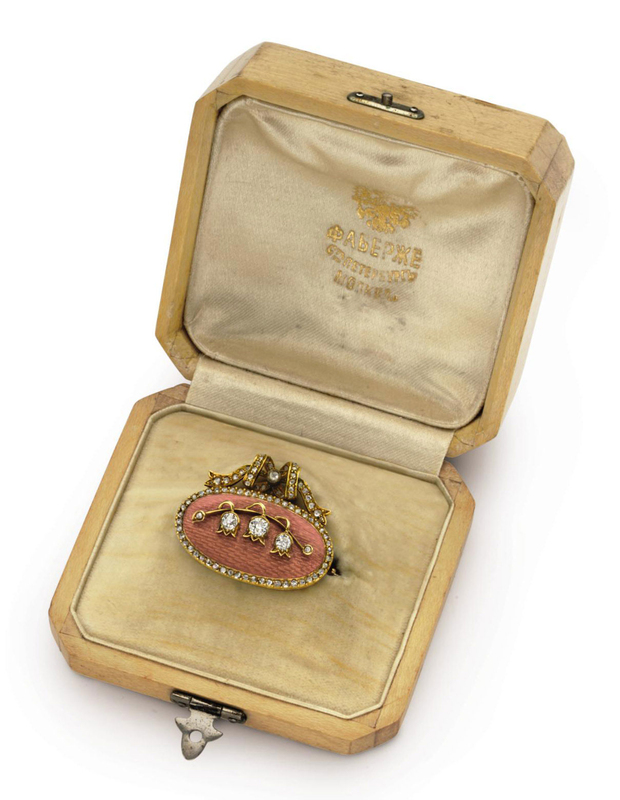 The present brooch, mentioned in the letter along with a quilt for the baby, was a thoughtful gift from the Empress to her dear friend. The choice of lily-of-the-valley, said to be Alexandra Feodorovna's favourite flower, makes the gift all the more personal and touching. Marion Delmé-Radcliffe (b. 1870) was a descendent of George, Duke of Clarence, K.G., brother of King Edward IV. In 1897, she married Baron Reinhold von Ungern-Sternberg (b. 1860), Master of the Household and Chamberlain to the Grand Duke of Hesse in Darmstadt. Known as 'Pollie', the Baroness was a close personal friend of Empress Alexandra Feodorovna (née Alix of Hesse and by Rhine), who was the daughter of Louis IV, Grand Duke of Hesse and born in Darmstadt. The mutual connection with Darmstadt formed the foundation of a life-long friendship between Pollie and Alix. Their relationship was chronicled in personal letters spanning three decades that are preserved by the descendents of the Baroness. The following three lots, according to family tradition, were gifts to the Baroness from Empress Alexandra Feodorovna.